From fried caterpillars to greasy rolex’s, Ghana to Uganda, South Africa to Morocco, the foods of the wonderful African continent offer ingenious combinations of flavour, nutrition and cost efficiency. Inspired by the spices of migrant settlers and the seasonal offerings of local farmers, the street foods across this continent are truly divine. Here’s our pick of the 14 African street foods you cannot miss out on. Bobotie is considered South Africa’s national dish. Minced beef is cooked with dried fruit and warming spices such as nutmeg, allspice and curry powder, topped with an eggy custard topping and cooked until golden on top. Bobotie is believed to have originated from Indonesian slaves of the Dutch empire during the 17th century. Bobotie is best eaten with turmeric rice and a fruity chutney. Originating from the Casamance region in Senegal, Poulet Yassa is an extremely succulent and tender chicken dish popular with the locals. Chicken legs are marinated in peanut oil, lemon juice, vast amounts of onion, spice and vinegar overnight and cooked over a charcoal fire. The result is so delicious and best eaten with couscous or roasted plantain from a nearby vendor. The Gatsby is the ultimate sandwich meal in one big baguette. Essentially it is a sandwich stuffed generously with crispy French fries. The Gatsby was unknowingly created by Rashaad Pandy in the 1970s who came home hungry from work one evening and threw everything he could find into a white baguette roll. The result was so good that he tried it out on the Cape Town locals and found instant success. When ordering, keep in mind that a Gatsby can easily feed four. Whilst the idea of eating insects provoke immediate discomfort, the delicious saveurs of Zimbabwe’s fried Mopani worms have won the hearts of those who try them. This is because not only are they so tasty, they are also incredibly high in protein, iron and calcium and their consumption is ecologically friendly. Mopani worms are eaten fried with tomatoes, onions, chillies and peanuts. Try these on the street or at a local restaurant if you dare. The boerie roll is South Africa’s take on the New York hot dog. 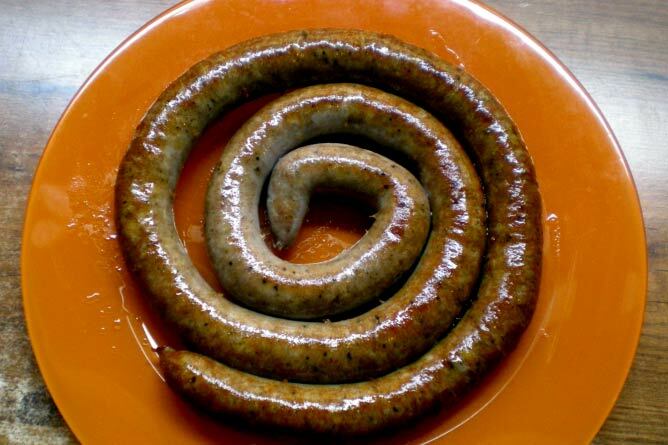 The world-famous Boerewor sausage made of beef, coriander, clove, nutmeg and allspice is cooked over a grill and served in a crusty white baguette. These South African delicacies have become popular foods at German Christmas markets. Fill the roll with toppings of your choice. Found largely in Mombasa and Nairobi, Kachi Keri consists of raw mango seasoned with chilli, lime and salt. A particular variety of local mango is harvested for this delicious snack and picked before ripened. The result is a green skinned mango with crunchy, tangy yellow flesh. Nowadays, Kachi Keri is hard to come by on the streets, but keep your eyes open for vendors selling this seasonal snack during the summer. Sometimes the best street foods are the simplest. Kelewele is a Ghanian snack made up of fried plantains seasoned with cayenne peppers, salt and ginger. The plantains are served up golden brown, crunchy on the outside and soft and juicy on the inside. Kelewele is often eaten with meat and bean stews but can easily be devoured on its own as a teatime snack. Bessara is a traditional Moroccan breakfast food. Fava beans are cooked in a broth of chicken stock, onions, garlic, paprika and cumin and pureed to a velvety consistency. The soup is finished with a good glug of extra virgin olive oil and paprika. If you enjoy savoury breakfast spreads, this soup makes for a great start to the day. Suya’s are the ultimate BBQ street snack in Nigeria. Strips of beef, chicken, fish or offal are marinated in a mixture of ground peanuts, paprika, onion powder and ginger and charred over a flaming grill. Eaten also across West Africa, Suya is adored by the majority of locals and can be found throughout Nigeria on the roadsides. 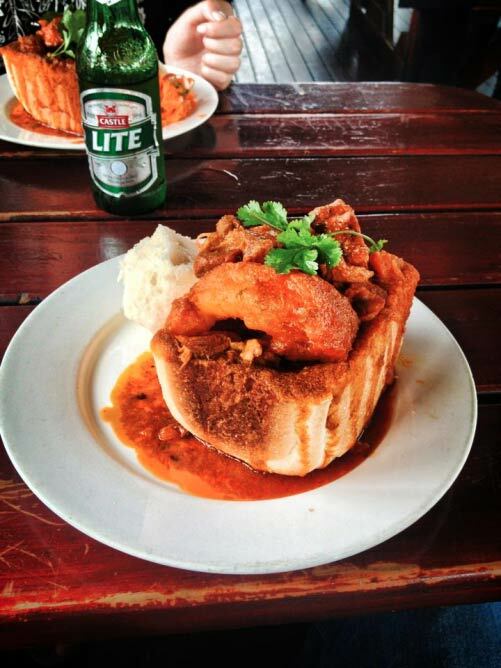 The Bunny Chow has made news across the world. In London, there is a dedicated restaurant to its delicious cause. A Bunny Chow is a hollowed out loaf of bread stuffed with spicy meat or vegetable curry. Its origins date back to the arrival of the Indian workers in the late 19th century in need of a cheap and filling meal to fuel their toils on South Africa’s sugar plantations. The bunny can be purchased from small diners and takeaway kiosks. Harnessing a vibrant and colourful cuisine, it’s clear why Madagascar is depicted as an indulgent tropical paradise time and time again. Street foods capitalise on the sweet flavours of anything from tropical fruits to freshly pressed coconut milk. Mofo Gasy is a sweet Malagasy breakfast bread made of rice flour, sweetened condensed milk, yeast and vanilla and cooked slowly over a charcoal grill. It is best eaten warm off the grill with a generous mugful of freshly brewed coffee. Moroccan sweets are famous all over the world such as the sticky baklava eaten with sugary fresh mint tea. For something more unusual, try the chebakia, a Moorish sesame cookie sold in markets. It is made from traditional Moroccan pastry that is shaped into a rose, fried and coated in rosewater, runny honey and sesame seeds. Chebakia is typically eaten during Ramadan. Traditionally eaten in Masaka and Kampala, a Rolex is a favourite fast food amongst Ugandan locals. The surprising name is derived from the Lugandan pronunciation of ‘roll of eggs’. It is indeed a Swahili chapati stuffed with scrambled eggs, shredded cabbage, tomatoes and onions. The Rolex is a highly versatile and inexpensive snack eaten at any time of the day and has even found its way on the menus of Kampala’s restaurants. Coffee lovers around the world cannot miss out on the coffee ceremonys taking place on the streets of Ethiopia. They are highly social events where leaders come together to discuss daily politics. 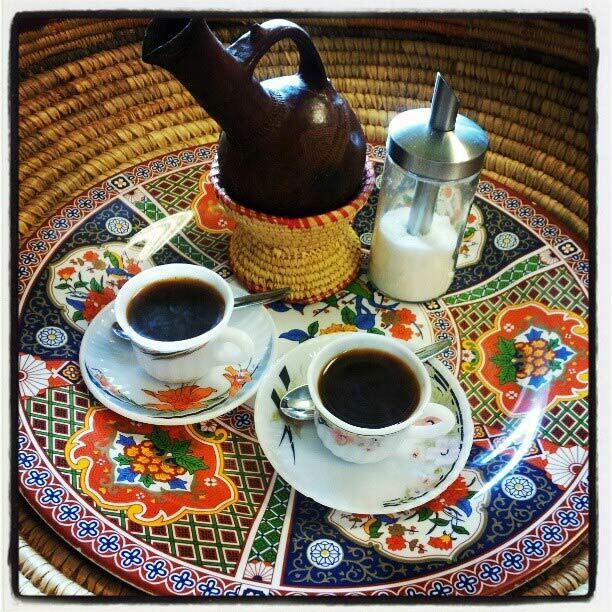 Beans are freshly roasted, ground and gently brewed in a ceramic pot called a jebena. The coffee is strained through a fine sieve and served in small china cups. Traditionally served with popcorn, peanuts or cooked barley, the fragrant coffee is drunk with plenty of sugar. Experience some of the finest coffee you’ll ever taste in a most elegant and intimate way.